A Self-Help Approach to Overcoming Depression. From leading experts, this practical book provides empirically tested tools for helping clients overcome depression by becoming active and engaged in their lives. Behavioral activation is a stand-alone treatment whose principles can be integrated easily with other approaches that therapists already use. Step-by-step guidelines are presented for identifying individualized treatment targets, monitoring and scheduling "antidepressant" activities - experiences that are likely to be rewarding and pleasurable - and decreasing avoidance and ruminative thinking. Rich clinical illustrations include an extended case example that runs throughout the book. More than 20 activity planning forms, worksheets, and other reproducible materials are featured. Meet Julie � a women who suffers from periods of depression. Julie and her family help readers to understand what depression is, what it is like to feel depressed and how it can affect their family life. She explains how coping with depression can sometimes be very difficult but there is support and help available that can relieve the feelings of depression. This illustrated book is an ideal introduction to depression � a condition that can be particularly difficult for children to understand. It is suitable for readers aged 7 upwards and shows family, friends and anyone who knows someone affected by depression how they can offer support. Through a series of worksheets and exercises, you'll evaluate your depression and learn key skills for overcoming it. Once you have your depression symptoms under control, you will appreciate the additional information on preventing relapse that is special to this new edition. This workbook also includes 25 bonus tips from depression experts that can jump-start your recovery. Recommended by therapists, this workbook will help you bounce back from depression, one solid step at a time. Presents a cognitive model of persistent depression that places particular importance on the role of thinking styles, underlying beliefs, subtle forms of avoidance and environmental factors. For the practitioner, this book offers guidance on how to address particular issues that commonly arise at each stage of therapy, such as: the patient is reluctant to engage in therapy the patient's negative thinking does not respond to standard therapeutic techniques the patient's negative beliefs have much basis in their experience the therapist becomes demoralised by the apparent lack of progress in therapy.Through extensive clinical material, this book demonstrates how entrenched negative thinking patterns and ongoing avoidance can be addressed to achieve significant change in many people's lives. Because this book satisfies the need for a straight-talking, no-nonsense resource on depression. The only agenda of "Depression For Dummies" is to present you with the facts on depression and explain the options for dealing with it. Rest assured, this is no infomercial in a yellow and black cover. Using solution-focused therapy, cognitive behavior therapy (CBT), and motivational interviewing, this workbook will help motivate you to combat the negative beliefs you have about yourself and end the self-destructive behaviors that sink you further into depression. This potent three-part approach will help you learn to identify your strengths, encourage you to take action, and teach you new coping skills. Once you're able to harness these new skills and enhance your existing strengths, you'll have the tools you need to make a positive and lasting change. Build Strengths - Create a personal set of depression solutions based on your hidden resources and strengths. Build Motivation - Find out how depression and other negative behaviors are hurting you and take a closer look at the benefits of overcoming them. Build Skills - Dissolve negative thoughts and feelings, improve your relationships, and recognize your depression triggers. A Guide for Living with Depression and Manic Depression. Matthew McKay presents a detailed overview of the history, causes, and treatment of mood disorders. Copeland expands on particular treatment strategies in greater detail, with provision for your responses which build to make a program for change. A very practical workbook with step-by-step self help guidance. If you have picked up this book, you probably want nothing more than to understand why you feel the way you do and how to feel better. You want those depressed thoughts, feelings, and behaviors to just go away, right? Inside you'll read about what depression is, how it can derail you, and effective ways to take care of yourself if you are depressed. Full of useful information, helpful self-reflection quizzes, easy-to-do exercises, and based firmly on cognitive-behavioral principles, this book will provide you with a concrete plan that could make huge difference in your health and well-being - a difference that lasts. Dorothy Rowe uses humour and stories from real life to illustrate both what defines depression and how it can be defeated through a true understanding of its causes. Depression and its allied problems are seen as the root causes of rising suicide rates, marriage break-ups, family breakdowns, misuse of drugs and many of the psychological problems that beset the modem world. Written in a reader-friendly manner, when you read ityou really hear Dorothy talking - and what a lot she has to say! Helping us to understand what is important in our lives, why we act and feel the way we do, guiding us to the point where we can accept and love ourselves for who we really are, Dr Rowe sees depression as a defence, as a place to where people retreat to. She shows that depression is not an illness or mental disorder, but a defence against pain and fear which we can use whenever we suffer a disaster and discover that life is not what we thought it was. By understanding how we have interpreted events in our life we can choose to change our interpretations and thus create for ourselves a happier, more fulfilling life Depression: The Way Out Of Your Prison is a proven self help guide as well as an invaluable source book that enables professional helpers to enter the world of the depressed person. Its clear account of the feelings and thought processes of those suffering from depression will enable them to lead more people out of their prisonsfor ever. Based on the author's extensive studies, Helping Your Depressed Child empowers parents by explaining how to recognize their child's depressive disorder. The book advocates a home wellness program and features a series of steps parents can take to help their child through depression. These steps include finding an appropriate therapy, getting professional help, and understanding pharmacological treatments. Also included is detailed information on techniques like deep breathing, visualizations, and affirmations. With an estimated 2.5 to 4 million children under 18 affected by depressive disorders, this book offers the comprehensive, in-depth help that parents need. A moving and ultimately uplifting insight into what it is to live with Black Dog as a companion and the strength and support that can be found within and around us to tame it. Stunningly illustrated this totally inspiring book is a brilliant expose of depression. The New Zealand born author now resides in Australia. Is He Depressed or What? Offers the partners of depressed men tools to help them support the man they love while still working to meet their own needs--socially, emotionally, and physically--within the relationship. This must-have guide for partners, family, friends and colleagues of depression sufferers, includes practical advice about recognising the symptoms of depression in a loved one, living with a depressed person, and helping them to tame their Black Dog. A Child�s experience of postnatal depression. When the mother of a family is anxious and depressed everyone in the family is affected. Knowing how to explain the sutuatio to children and to the current baby later in its life is a considerable dilemma. Picture story books often create opportunities for conversations, especially about more difficult issues. This story is about changes in Sally's family. Her Mum is different after Ben is born, and Sally is worried that she is responsible. This authoritative, easy-to-use self-help program is based on methods clinically proven to reduce the recurrence of chronic unhappiness and demonstrates powerful ways to strengthen resilience in the face of lifes misfortunes. Includes a CD of guided meditations. A step-by-step program to help you understand depression in a completely new way, recognize the depression traps in your life, use acceptance to move through painful life situations, develop a mindful, values-oriented lifestyle, and commit to acting in ways that promote vitality, purpose & meaning. If you�re a teen with depression, you may often feel sad, lonely, and unmotivated. And it can be especially difficult to do well in school, make friends, and take those important steps toward adulthood. But it�s important for you to know that your depression is not your fault, and that it doesn�t have to define you. Most importantly, there are steps you can take to feel better. With this powerful workbook, you�ll learn effective skills based in mindfulness and positive psychology to help you manage difficult emotions, gain distance from negative thoughts, and enhance your awareness of the present moment. You�ll also discover tons of activities and exercises�such as mindful meditations, walking, yoga, healthy eating and sleeping tips, and more�to help you care for your body as well as your mind. Depression can make it seem like you're viewing the world through dark or distorted glasses. When you're depressed, it�s even hard to see yourself clearly. This book will empower you to feel better, more energized, and start reaching for your goals�one step at a time. An authoritative book filled with mindfulness tools that deliver an essential set of engaging, practical strategies along with key research and evidence-based information. The awareness boosting methods in this guidebook offer participants a means of reappraising and observing negative and anxious thoughts, habits, pain, and stress in fresh ways that produce new insight, positive change, and a sense of hope. Featuring over 40 easy to use, reproducible handouts and expertly crafted, guided scripts-such as working with the breath, overcoming depression with here and now pleasantness, calming the anxious mind with sense grounding, expanding a client's strength narrative, the stress pause S-T-O-P technique, and meditations for peace, acceptance, and re-envisioning pain-this book is ideal for clinicians wanting to integrate mindfulness into their work. This bestselling work has introduced tens of thousands of clinicians to mindfulness-based cognitive therapy for depression (MBCT), an eight-week program with proven effectiveness. Step by step, the authors explain the 'whys' and 'how-tos' of conducting mindfulness practices and cognitive interventions that have been shown to bolster recovery from depression and prevent relapse. Clinicians are also guided to practice mindfulness themselves, an essential prerequisite to teaching others. More than 40 reproducible handouts are included. Book purchasers get access to a companion Web page featuring downloadable audio recordings of the guided mindfulness practices (meditations and mindful movement), for use by clinicians and clients, plus all of the reproducibles, ready to download and print. A Practical guide for Australian families. Postnatal depression (PND) affects at least one in ten new mothers and their families. This book discusses signs and symptoms of PND, professional help and how to get it, how a woman can help herself, and how her partner, other family-members, and friends can help, as well as the affect on the woman's partner and how he might best help himself. The book provides sound answers to many frequently asked questions in a warm and optimistic way. There is very little published on PND that is intended for those who experience and live with it. This book, by an Australian author who has personal experience of PND, is a significant and practical contribution. With suicide as the third leading cause of death among young people ages 15 to 24*, education professionals and guidance counselors must understand--and know how to address--adolescent depression. This innovative workbook provides them with the guidance they need. Counselors can use it in their work with teens, who can use the surveys, checklists, fill-in-the-blanks, and activities to recognize depression in themselves, learn what they can do to feel better, and build a safety plan to stay well. The book also gives any professional who works with teens valuable information on the symptoms, causes, treatments, and effects of depression. Recovering from depression is possible--and this interactive workbook guides both teens and the people who support them. Includes tips and activities on - dealing with suicidal feelings - changing negative thought patterns to positive ones - reaching out to friends and supporters - avoiding substance abuse - avoiding "triggers" of depression. This stunningly illustrated, multi-award winning book opens a window to our inexplicable emotions and tells a story about the power of hope, renewal and inspiration. A great way to begin discussions about emotions and feeling disillusioned and downcast. Don t want to get out of bed in the morning? Feeling as though the light at the end of the tunnel is fading? You may be suffering from depression, a condition Winston Churchill referred to as the Black Dog. Taming the Black Dog is a simple guide to managing depression, which an estimated 1 in 5 people will suffer in one form or another at some time in their lives. This small illustrated tip book contains factual information as well as treatment options. Modelled on Bev Aisbett s successful Living with IT, Taming the Black Dog has a unique blend of wit and information and is an invaluable guide for both chronic sufferers of depression as well as anyone with a fit of the blues . Everyone gets the blues, but some people get too blue. The World Health Organisation says that depression will be one of the major causes of death and suffering in the twenty first century. Depression is common, troublesome, painful and dangerous. It is frequently overlooked and often mistaken for mere blues and blahs. Written for adults but also useful to teenagers, Too Blue, will take you on a journey into the world of depression. Through words and cartoons this book vividly illustrates and explains depression and other mood disorders. The simple text and many drawings bring the symptoms of depression and the havoc of mania into clear focus. Treatments are described and explained in a balanced way. A special section is provided for those who want to know something about the underlying workings of the brain and how they relate to depression. Too Blue is an encouraging book which tackles tough topics like suicide in a clear and helpful way. It is a book which will prove useful to those who suffer from depression and for other people too. After all, just about everybody, sooner or later, is involved with someone who is seriously depressed. The author and illustrator of Too Blue is a psychiatrist who shares with the reader knowledge and optimism acquired through decades of helping depressed people battle their painful illness. This book focuses on the structuring and delivering of hypnotic interventions for major depression, with a substantial use of concepts and techniques from cognitive-behavioral and strategic approaches as a foundation. 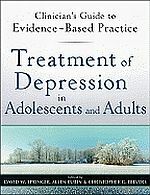 Current research on depression is used in this book to emphasize the still-growing knowledge of depression. Hypnosis has shown itself to be effective in not only reducing symptoms, but in teaching the skills (such as rationale thinking, effective problem-solving and coping strategies, and positive relationship skills) that can even prevent recurrences. Mental health professionals will find the detailed examples of hypnotic strategies invaluable to their own practice and application of hypnosis in the treatment of depression. Mental health practitioners are increasingly forced to use evidence-based practices by third-party providers. However, studies have shown practitioners rarely use evidence-based practices because of difficulties obtaining training and expertise. This volume in the Clinician's Guide to Evidence-Based Practice Series provides clinicians with a beginning level of understanding in evidence-based practice for depression in a manner that fits clinician time constraints. Forgoing the typical academic approach for a more user-friendly "how-to" and "what-now" style, the book is an easy-to-use and essential resource for practitioners and students-in-training. This one-of-a-kind resource provides the busy practitioner with empirically supported treatments for seven frequently encountered disorders: major depression, generalized anxiety, panic and agoraphobia, PTSD, social phobia, specific phobia, and obsessive compulsive disorder. Serving as ready-to-use treatment packages, chapters describe basic cognitive-behavioral therapy (CBT) techniques and how to tailor them to each disorder. Also featured are diagnostic decision trees; therapist forms for assessment and record keeping; client handouts and homework sheets; and session-by-session case examples. Tips for troubleshooting common therapeutic roadblocks are presented, as are strategies for ensuring third-party payment authorization. The searchable CD-ROM enables clinicians to rapidly generate individualized treatment plans, print extra copies of therapist and client forms, find the facts about commonly prescribed medications, and learn more about cognitive-behavioral techniques. This interactive book explains depression and its treatment in kid terms, reassuring children that their parents can get better. It explores the many feelings children usually have and helps express and understnd them. Provides practical tips for coping with a parent's depression, showing how children can feel better to. Comprehensive and authoritative notes to parents by clinical psychologists and social workers.